Not a perfect plugin, but Multicomp Plus has a charm and character of its own that's earned it a spot in our plugins folder. Versatile. Characterful. Low-cost. Pleasing sidechain pumping action. Slow release. Can't disable automatic make-up gain. Analogue mode overly subtle. 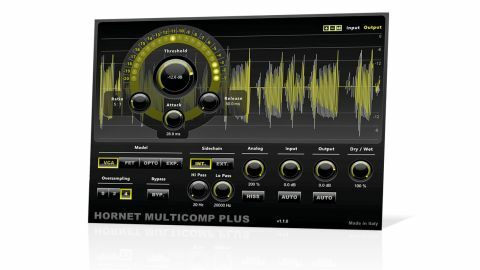 HoRNet's Multicomp Plus sets out to emulate three types of analogue compression - VCA, FET and Optical - plus expansion, in one plugin (VST/AU/RTAS). It's a straightforward affair: select a compression model (or the downwards Expander), then set the Threshold, Ratio, Attack and Release parameters. Ratio runs from 1:1 to 20:1 in both VCA and FET mode, but is disabled (as are Attack and Release) in Optical mode (mimicking the Teletronix LA-2A, we assume). Each of the compression models delivers its own individual character and response, particularly when the input signal, threshold and/or ratio are pushed hard. While not quite the last word in analogue emulation, each does generally behave as it should when fed the kinds of signals and sounds traditionally associated with its type (see the boxout below for more info). "It does have a particular character of its own, and it can be pleasingly crisp or roundly powerful"
More than that, though, the multi-mode approach encourages experimentation with the different compressor types, resulting in richer and more diverse signals and so better and more dynamic mixes. This is arguably more useful than strict authenticity, especially when there are already so many slavish, one-to-one recreations out there. Multicomp Plus' sidechaining deserves a special mention too. In addition to high and low filters, the external option offers a distinctive and especially pleasing pumping action that is bound to excite dance music producers of all genres. That said, the slow minimum release time (50ms) limits its usefulness in other mixing uses such as using vocals as a sidechain key to duck guitars or pads, to accentuate the vocal. Less impressive is the Analogue control. It's designed to emulate analogue saturation when engaged but is so subtle as to be extraneous. The Dry/Wet knob enables parallel processing, while 2x/4x oversampling provides a cleaner sound at the expense of higher CPU usage (not particularly high in either mode, it must be said). There are also selectable automatic input and output gain controls to lock down a constant signal level of -18dB. These are a nice idea but a little clunky: both can take several seconds to calibrate, with the level jumping audibly in that time; and fluctuating input signal levels can cause similar wobbling, too. They're also not to be confused with the automatic make-up gain, which, annoyingly, can't be switched off. The scrolling waveform - with zoom - at the top of the GUI shows the level and shape of the signals going in (grey) and coming out (yellow). It's not really clear enough to be very useful, but you can disable it. The gain reduction meter is better, with a clear display and two-second peak hold. We were a tad disappointed that there's no SSL-style auto release, and baffled to find that there are no presets at all. Some compressor plugins offer instant gratification, applying a powerful and distinctive effect the moment you push a signal through them. Multicomp Plus isn't one of them, and it's not quite up there with emulations by Softube, Waves or Universal Audio when it comes to pure sonic authenticity. However, it does have a particular character of its own, and it can be pleasingly crisp or roundly powerful - we had success using it on individual instruments as well as mix and group busses. With a sound that's distinct from other similar plugins and three different compression modes, this one is well worth a try.